Success! After last week’s disastrous attempts I was sceptical about whether or not I was going to be able to say that. Thanks to a lot of encouraging advice from friends and family after my plea for help, I summoned the strength to try again on Saturday. So out came the blackberry crème patissiere (which I had to stash in the freezer while I regrouped – turns out it freezes very well by the way), piping bag and other paraphernalia and off I went again. This time I used a recipe with slightly less water (thank you Judy!) and made a few other tweaks which I’ve highlighted in the recipe and as soon as the choux buns went into the oven I could tell this batch was going to behave itself. So I have conquered my first technical challenge which should bring with it some sense of achievement… but the other thing I learnt this month was that profiteroles and I still don’t quite get on. With most things you bake, the sense of satisfaction hits as soon as they come out of the oven, risen and golden and just as you hoped. 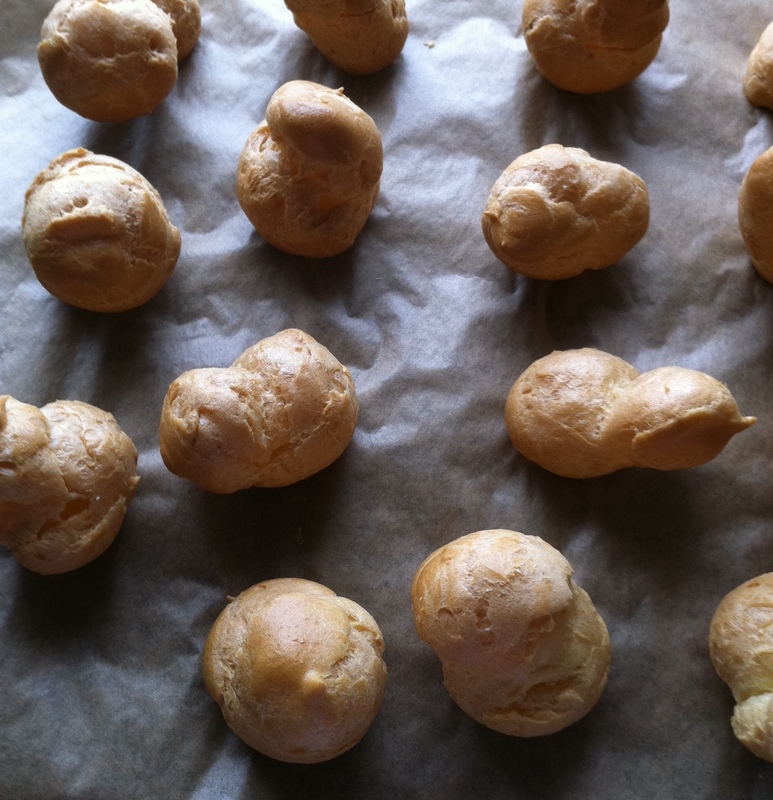 With choux pastry, the pressure only increases when they come out of the oven. Then one has to endure the excruciating process of waiting for the last possible moment to fill them and hope that somebody eats the last one before the pastry goes all soft and frankly, inedible (I can’t bear to throw pastries in the bin, its like abandoning children). So profiteroles just don’t have that soothing effect that one gets from preparing cakes and the like and knowing your work here is done. Having said all that I am still just a little proud of myself, and I think I’ll make them again, as more of a pudding, with a hot sauce and ready and waiting mouths to eat them all at once, which I think is how best to enjoy them. You’ve probably also noticed that these little guys are flaunting a fairly unorthodox flavour combination, because this is my November “extraordinary flavours challenge” entry as well. This idea started with Whittards flavoured tea again but this time it was a bag of Amaretto fruit infusion that got me thinking. The infusion is made up of dried almonds, rose hips and blackberries amongst other things and the fruity and yet aromatic wafts off a cup of this brewed with hot water made me think about winter fruits and warm spicy flavours and how well they support each other (think cinnamon and apples). So my brain wandered from there through various potential combinations until my stomach arrived at blackberry and chai. 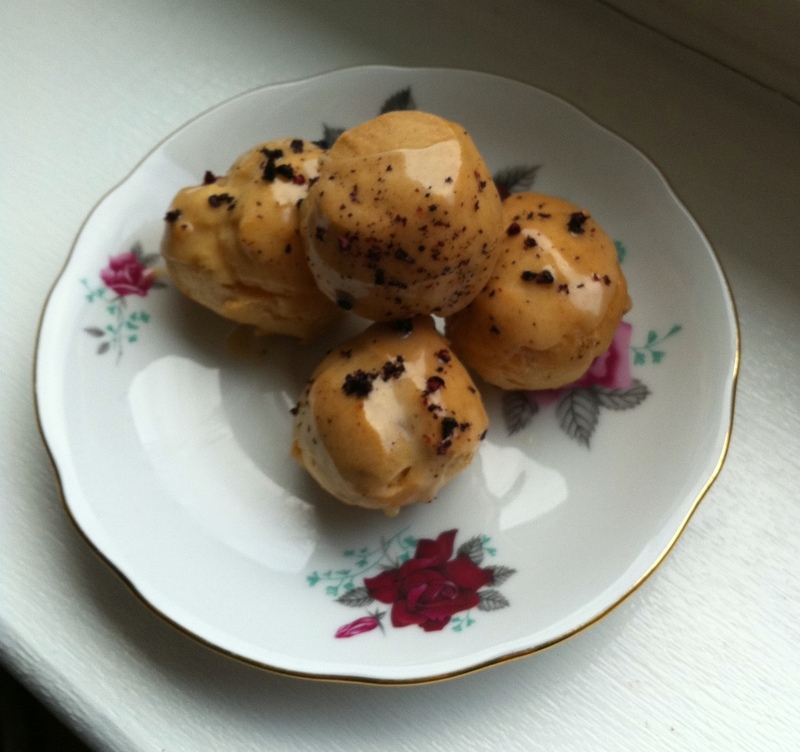 It definitely works… and makes you sound awfully posh in front of your guests when combined with the word profiterole. If you like the flavour idea but you don’t want to make profiteroles or you want to make something to give as a gift that has a bit more shelf life then you could just as easily use the same idea for biscuits or cupcakes. Flavour the base with either the fruit or the tea and use the other one for the filling/icing. 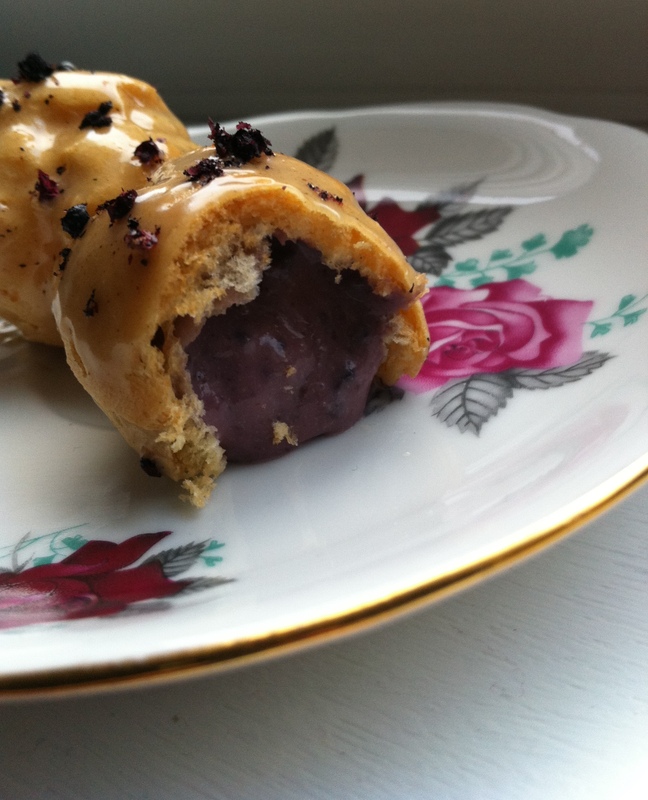 Adapted from a choux pastry recipe collected by my aunt Judy from a South African Fair Lady Magazine. The basic crème patissiere recipe is adapted from this one. Make the creme patissiere first. Put the cornflour and sugar in a bowl and stir in the eggs to make a paste. Add the split vanilla pod and the fruit infusion if using, to the milk and bring to a simmer. 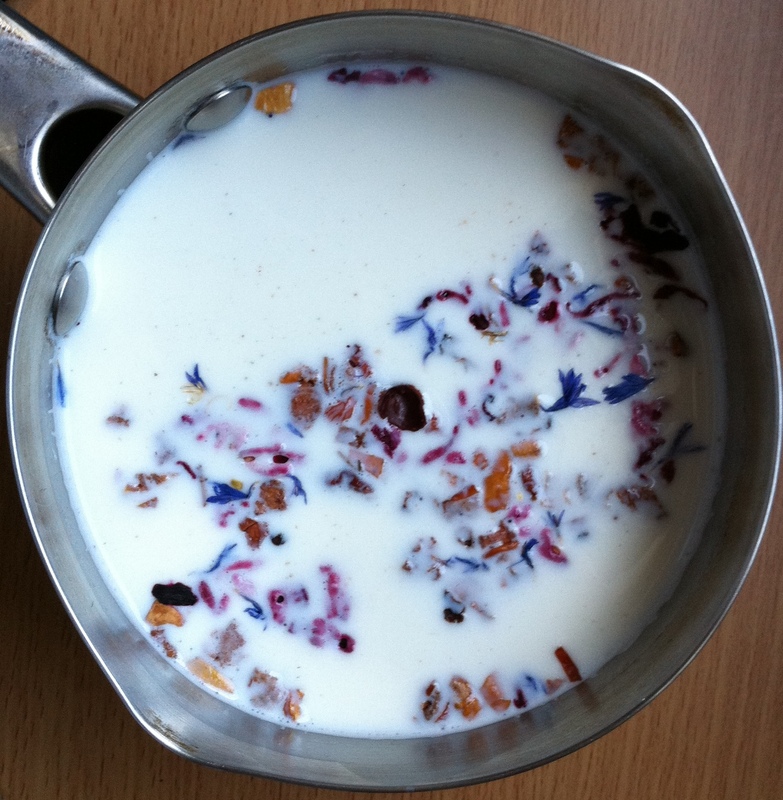 Sieve the milk into a bowl to remove the dried fruit and pod and scrape any remaining vanilla seeds into the mixture. Pour onto the eggs, stirring constantly, then return to the pan and stir over a low heat until the mixture thickens. 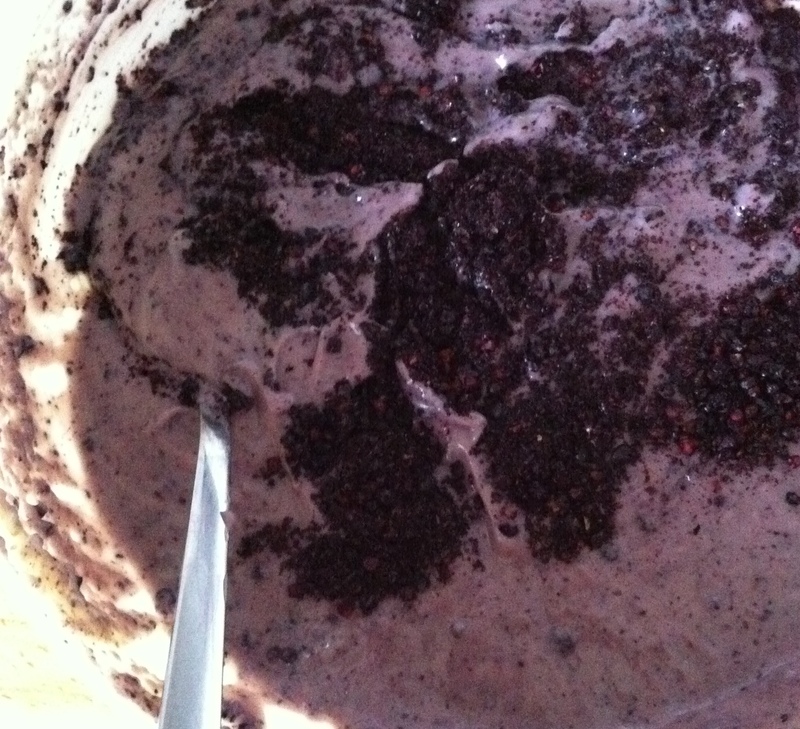 Pour into a bowl and mix in the blackberry powder.Cover with cling film and leave to cool before chilling in the fridge. For the choux pastry, put butter and water into a saucepan and gently melt the butter. Bring to the boil, take off the heat and tip in the mixture of flour and salt. Return to the stove and beat for 1-2 mins or until mixture is smooth and leaves the sides of the saucepan. Leave 5 – 10 mins to cool. Add the eggs a little at a time, beating thoroughly after each addition (with an electric mixer to beat in enough air) to make a smooth , shiny paste that will hold its shape. Pipe 7cm circles onto a baking sheet lined with parchment and bake at 200C for 20 -30 minutes, or until well risen and golden. If you have a hot oven like mine then turn the oven down after 10 min to about 170C so that they don’t burn. Remove from the oven and make a slit in the side to release the steam. Dry out for another 5 min in the cool oven if necessary (I found they didn’t need it this time round). To make the topping, melt the chocolate in a pan over a pot of boiling water. Infuse the chai teabag in just enough cream or milk to soak the tea bag and stir over a low heat to concentrate. Drain the teabag and add about a tsp of this to the chocolate, not too much or it wont set. Stir in the spices and cool slightly. 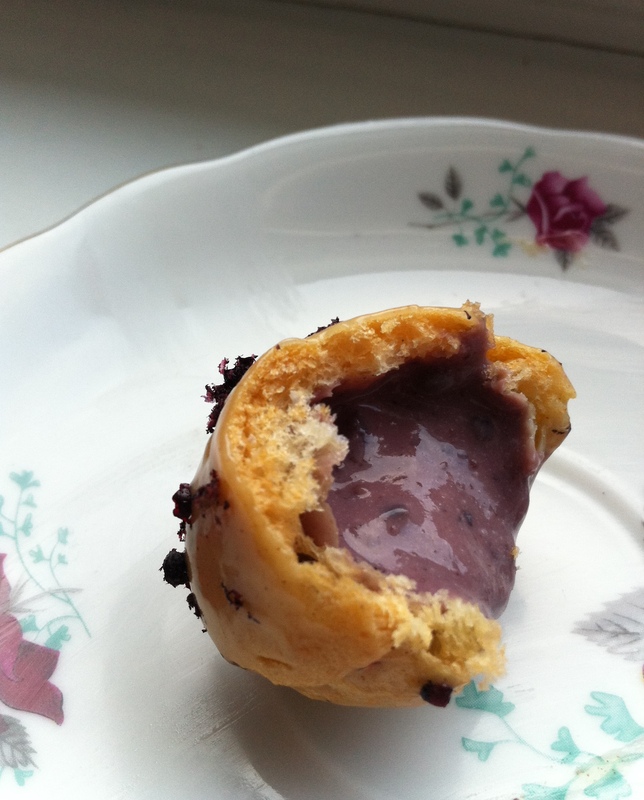 Dip the top of each profiterole in the ganache and sprinkle with blackberry powder. Set aside to cool and set. You can do this before you fill them as it doesn’t seem to soften the pastry too much. If you were making this as a pudding you could also add more cream or milk to make a warm chocolate sauce and pour over the profiteroles at the last minute. Pipe in the filling just before you serve them (ideally no more than an hour beforehand or they will get soft) by poking the nozzle through the bottom of the profiterole or by cutting them in half and replacing the lids after you have filled them. I’d love to know if this recipe works for other people so please let me know if you try it and even better send me your own flavour ideas! Next month I’ll be posting my challenge subjects at the beginning of the month so that you can enter your own versions if you’re feeling competitive! 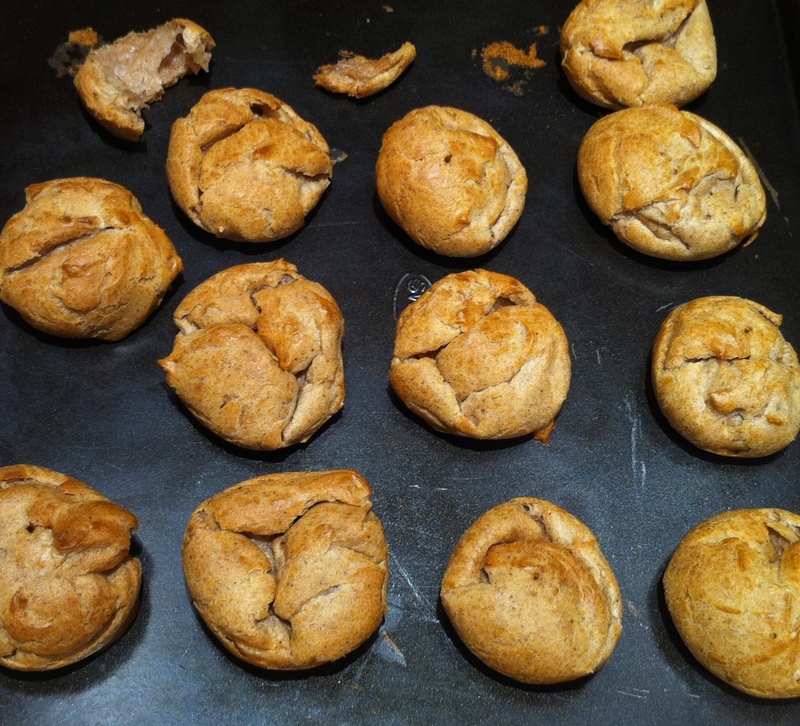 Crumpled and deflated profiteroles with soul-destroyingly sad, soggy centres. And so the first post in my technical skills challenge (choux pastry this month in case you hadn’t cottoned on by now) becomes a plea for help. I did try and leave the first batch in longer to see if the dough would cook through but this only served to over cook the outside and leave the insides in the same miserable state. After attempt number one I thought I might have left too much moisture in the dough after the first step and perhaps had too hot an oven but switching to a recipe with slightly less water (150ml water to 75g flour and 50g butter) and adjusting my oven, which does tend to be a bit hot, to 190 degrees instead of 200…nothing. The same soggy middle and uninspiring flump as soon as I took them out of the oven. I realise the photos dont win any awards either but why you would want to take the time to properly photograph such a crushing defeat. So I now sit here in front of my laptop in despair. The worst part is I had decided to combine my technical challenge with my flavour challenge in one recipe which means I have nothing to show for either until I get over my inexplicable nightmare. Which is where I need help… if any of you have made choux pastry before and can provide any insight into what I’m doing wrong, please please send instructions! My culinary education and my pride (I cant fail at the first real challenge) depends on your help.